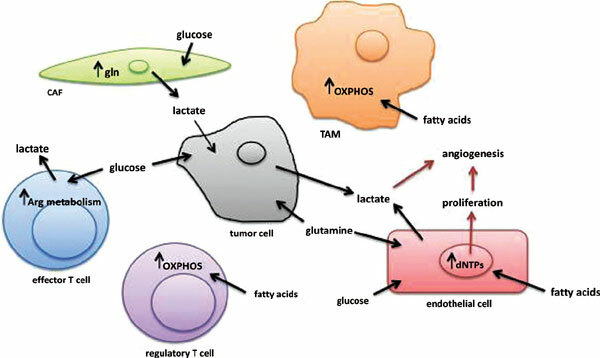 Background: In the 20th century, cancer metabolism has been studied from different aspects. In the last decade, the interest in this issue has been renewed and many studies have been carried out on tumor and endothelial metabolism. Although tumor metabolism is well recognized, there are some discrepancies between what we knew and what has been studied lately about the metabolism of endothelial cells. Moreover, cancer and endothelial cells are not alone in their microenvironment. Immune cells and fibroblasts are also present and have a crucial role in tumor-associated inflammation, as well as in tumor progression, metastasis and angiogenesis. Nevertheless, metabolism of these cells is poorly understood. Conclusion: In the present mini-review, information about metabolic characteristics of these cells is summarized and compared with our knowledge about cancer and endothelial cell metabolism. This knowledge could contribute to open up innovative approaches to the treatment of cancer. Endothelial cells, fibroblasts, glycolysis, glutaminolysis, immune cells, metabolic reprogramming of cancer, tumor cells, Warburg effect.